Click the colored squares to see the different rates of expansion. If we look at the Universe over a much longer timespan, however, we can see that the rate of expansion was not always constant. During Era 1, the Universe underwent a brief period during which the expansion rate rapidly accelerated. During Eras 2 and 3, it decelerated as the force of gravity resisted the expansion. Click the "More Information" button to learn more about the possible fates of the Universe. Different models predict different fates of the Universe. In some, gravity continues to slow the expansion rate. Although the Universe would expand forever, as the expansion rate critically approaches zero, the Universe would increasingly resemble Einstein's Static Universe. In other models, the force of gravity is strong enough to overcome the expansion. After reaching its maximum size the Universe would contract and end in a Big Crunch. Still, other models predict that the expansion rate will accelerate and the Universe will continue to grow in size forever. 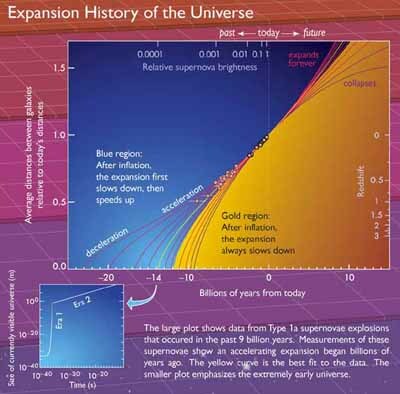 This graph shows the history of the Universe's expansion rate. The data points represent redshift measurements from distant supernovae and fall along a set of possible curves in the blue region of the graph. All of these curves are consistent with histories detailing a post-inflationary period of decelerating expansion followed by the current era of acceleration. The curves in the gold region that are ruled out by the data are consistent with histories in which the expansion rate has been constantly decelerating since inflation. There is no explanation from classical physics to explain the current acceleration of the expansion rate. The acceleration indicates that gravity (which slows down the expansion) is counterbalanced by a mysterious repelling force. Physicists call this mysterious force dark energy. It takes the form of an outward pressure constant and seems to be pushing the Universe to expand faster and faster in every direction.